When creating the costume for the character of Joe Junkman, there were really two things going through my head: the color pallet of the costume and to make an outfit that contrasted James Gray’s costume. I started by doing some research on post-apocalyptic trader cosplays. However, I quickly realized that I didn’t have the money or the skill to make something as elaborate as the images I found online. So I decided to just wing it. As Ron previously mentioned, we took a trip to the local goodwill and looked through the old clothes. I found a pair of old greenish-tan khaki pants and a huge, ugly, suit coat and vest combo. Seriously, this thing seemed to be made for Fat Albert or something. I bought the suit combo because I figured if Joe Junkman was a sleazy used car salesman type he would wear a tacky looking suit jacket. The jacket ended up being far too hot for filming in the desert in the middle of summer and it just didn’t fit right. The vest it came with however, worked perfectly. After doing some makeshift alterations on the vest so that it would fit right I had: some green pants, a brown vest, black air force pilot boots that I borrowed from my dad, and a green hat that matched the green pants. The only major thing the outfit was missing was an undershirt and bandanna to tie the whole thing together. I had an old stack of 5 long sleeve shirts that were identical in every way except for color and about 4 different colored bandannas. I tried them all on with the rest of the outfit and basically picked my top 3 favorite combinations. From there I sent those 3 combinations to Ron and other friends and family to get their input. The final combination worked quite well in my opinion. The dark blue shirt clashed well with Grey’s lighter colors. The dark blue also fits well with Junkman’s negative personality. The red bandana added some much needed color and the color contrast creates a focus point that draws the eye to Junkman’s face. The red bandana also serves to show to the audience that even though Junkman can be very negative at times he is still full of energy. The vest adds a little accent that breaks up the otherwise pretty boring shirt. The green pants and hat were a good way to bookend the costume and paired with the green backpack Junkman uses, it created a consistent color pallet. Little details include a broken compass around Junkman’s neck which further pushes how lost Junkman really is in the post-apocalyptic world. And some goggles resting on his hat. The goggles were pretty much added in practicality so that Junkman would be able to brave the radiation storms. Finally, I cut off the pant legs and duct tapped them back together to add some more variety to the pants. Once I had the costume down I took my pocket knife and marked up the shirt, vest and pants as much as I could adding holes and frayed edges. Finally Ron and I took our costumes and basically rubbed them in piles of dirt to make them feel more lived in and dirty. Now that I know a little more about weathering I know that this is a pretty ineffective way to do this. The dirt does not translate well on screen as you can barely see it. All it did was make the costumes a lot more uncomfortable to wear. It is funny though just by wearing the costumes every weekend for 3 months in the desert naturally made them look more and more weathered. One thing I want to bring up real quick is how uncomfortable my costume was at times. This costume was incredibly uncomfortable. The long sleeves, pants tucked into the boots and bandanna all practically created a seal that trapped in all heat and sweat. Add to the fact that I was running around in character, as well as constantly setting up the camera and microphones; I was constantly worried about heat exhaustion. Several scenes where I had to carry the backpack actually made me ill. So in the future I would definitely create a costume that can breathe a lot better. So that is pretty much my process in creating the costume for Joe Junkman. I hope I get a chance to revisit the character in the future so that I can make an updated costume for Joe. Now, I need to get back to not working on the first episode of MUTATION. You never know what’s gonna sneak up on you out in the Rad-Lands! While filming the MUTATION YouTube series, my friend Ben and I designed our own wasteland costumes. I took on the role of James Gray while Ben portrayed Joe Junkman. In preparing our costumes, there was a lot of reworking of both concept and costume ideas. Originally, I thought James Gray would be either a soldier in light combat armor or a generic post-apocalyptic survivor (hoodie, gasmask, jean, etc). Ultimately, both of those ideas were rejected. Instead, James Gray’s motif shifted toward a futuristic parody of WWI Australian cavalry, distinguishing MUTATION’s setting from other post-apocalyptic worlds. The original inspiration for James Gray. To construct both James Gray and Joe Junkman, Ben and I went to our local Goodwill. Living near a military base, I found a long sleeve desert camo jacket that would become the base of the outfit. I then set to work on making the jacket more wastelandish. I began by unevenly cutting off the sleeves, making them seem torn. Then both Ben and I submerged our outfits in a mound of desert sand. This made the outfits course and uncomfortable, but most importantly it made them look lived in as though these characters have been marching across the wasteland for months. To complete the outfit’s skeleton, I collected green camo shorts that offset the gray and brown camo jacket. I then grabbed a pair of crumbling 20 year old work boots. The walnut color contrasted both the desert sand and the jacket. The rawhide laces completely deteriorated during filming. Finally, I picked up an “Aussie” slouch hat and gave it a dirt bath. Thinking of stereotypical Aussie hats with crocodile teeth, I decided to give Gray a hatband of bullets, adding to the wasteland feel and reflecting the violent environment. With the bulk of James Gray’s outfit put together, I now added detail to the torso. As Gray is a soldier, I thought it would be fitting for him to display some awards. For this, I used some old ROTC ribbons and medals (not caring about what they represent or their order). I added a button depicting WWII airplane’s to the collar of Gray’s shirt; this adds a little color flair to his appearance, a sense of scavenging, and subtly reinforces a militaristic history on close ups. Next, I gave Gray a bear claw necklace to reinforce his status as a wasteland survival expert and perhaps give his character a sense of tribalism, subtly reminding the audience that society has regressed to a constant struggle for survival. Finally, I latched a belt around Gray’s mid-section to break up the camo jacket and add a little of the WWI motif. Moving on to the belt, I wanted Gray to feel like a survivor who lives in the world and has his own story (because he does). To do this, I first gave him a small brown bag that hangs from his side. This bag is filled with MUTATION’s currency: dog tags, military challenge coins, and squadron patches. Next, I hung a Nalgene bottle from Gray’s waist; the water in the bottle decreases in each episode, adding to the sense that Gray and Junkman are really living out in the wasteland. As a last minute addition, I picked up a leather hunting bag. The sand colored leather contrasted well in the desert environment and although it was cumbersome to carry around, I feel that it added a lot to the character. Finally, I focused on the tiny details, details which the audience won’t see, but that add to Gray’s personality. I filled Gray’s pockets with trinkets and items he would find useful, but that served no purpose in the show. A comb, cards, a bottle of pills, multiple pocket knives, dog-tags, and other trinkets helped me to think about how James Gray responds to the world he lives in. Additionally, James Gray wears two watches, one for California time and the other for Australian time, a constant reminder of his lost homeland. Although these ideas are less present in the show itself, they were developed further in The Journal of Joe Junkman, the MUTATION novel (in progress), and James Gray’s twitter account. Even though the MUTATION YouTube series is still some ways away and may even be somewhat outdated as both Ben and I have dramatically improved on our writing, acting, and editing since the original filming, I thought it would be helpful to share what I found to be most important in constructing a post-apocalyptic costume. 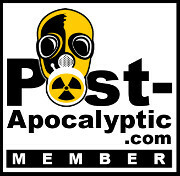 Whether at Wasteland Weekend, Halloween, or just for fun, your post-apocalyptic outfit tells a story. I’ve always said that a living breathing fictional world is more impressive than one that only serves to tell a particular story. I hope this break down has helped you to think about the subtleties of wasteland attire. You can tell a lot about a person by their clothes and body language, but you can more easily tell when loving details have been added to enhance the experience. Costume detail and loving design is something that has been a pillar of post-apocalyptic fiction and I hope it continues to charm and delight. As you move forward with your own costume design, I want you to consider if your wasteland alter ego is just you in a tattered outfit or something more. See you in the Rad-Lands!